Ahdesiveless breathable porous polyurethane underwrap tape. Can be used as a base in functional bandages and cushioning bony prominences. 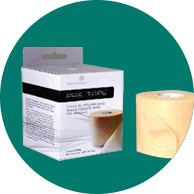 Recommended as a base for joint strapping, avoiding the risk of slippage and pain when removing adhesive bandages. Indicated to provide comfort, especially for users with sensitive skin.